Asthma is a breathing disorder that causes air passages of the lungs, called bronchioles, to swell and narrow. During an asthma attack, the patient has difficulty breathing because the muscles surrounding the airways become tight and the lining of the air passages swells which reduces the amount of air that can pass by. Because the bronchioles of an asthmatic patient swell up and tighten, this results in wheezing, shortness of breath, tightening of the chest, and coughing. Triggers that can cause asthma are varied, generally asthma can be triggered by chemicals in the air or food, exercise, weather, stress, medicine, and allergens. Asthma has no cure. The disorder can only be managed and controlled. Inhaled corticosteroids help keep the airways from swelling which help prevent asthma symptoms. 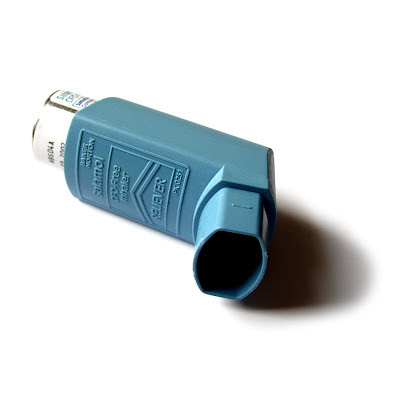 There are also long-acting beta-agonist inhalers which prevent the symptoms but these must be used together with another inhaled steroid drug. Avoiding asthma triggers is also important in maintaining control and preventing attacks. Cigarette smoking and second hand smoke (passive smoke) in regard to people with asthma causes problems in effectiveness of management medications such as steroid/corticosteroid therapies. Children who use inhaled steroid drugs for asthma end up slightly shorter at their full adult height than children who don't use the drugs, new results from a comprehensive asthma study show. The findings will be presented Sept. 3 at the European Respiratory Society meeting in Vienna, Austria, and published online the same day in the New England Journal of Medicine. The study's senior author is Robert C. Strunk, MD, the Donald Strominger Professor of Pediatrics at Washington University School of Medicine in St. Louis. The study involved more than 1,000 children ages 5-12 who were treated for mild to moderate asthma as part of the Childhood Asthma Management Program (CAMP) clinical trial. The children received treatment for more than four years at eight centers, including Washington University School of Medicine. They were divided into three groups: one received twice-daily budesonide, an inhaled corticosteroid medication; a second group received nedocromil, an inhaled non-steroid medication; and a third group received a placebo. All children received albuterol, a fast-acting drug for relief of acute asthma symptoms, and oral corticosteroids as needed for asthma symptoms. The researchers followed 943 participants in the trial at regular intervals until they reached adult height. Females were considered to be at adult height at age 18 or older and males at age 20 or older, Strunk says. In the first 4 1/2 years after the end of the trial, researchers took patients' height and weight every six months. Over the next eight years, height and weight were measured once or twice a year. The mean adult height was about one-half inch, or 1.2 centimeters, shorter in the group that received budesonide than in the patients who received nedocromil or placebo. The patients who experienced the slower growth were primarily between 5-11 years old when they began using budesonide. The slower growth took place only in the first two years of the four-year study. As the study progressed, the children who took the budesonide remained one-half inch shorter through adulthood than the children who did not use the drug, says Strunk, who treats children with asthma at St. Louis Children's Hospital. "This was surprising because in previous studies, we found that the slower growth would be temporary, not affecting adult height," Strunk says. "But none of those studies followed patients from the time they entered the study until they had reached adult height." Strunk, CAMP study chair, says researchers considered various factors that also might have contributed to the slower growth rate, including gender, age at the time the child entered the trial, how long the child had had asthma, as well as ethnicity, severity of asthma and reactivity to a skin test for allergies. "We found it made no difference if they were boys or girls or how long they had had asthma, or any other of these factors," Strunk says. "We also looked at the height of the parents, and that didn't have any impact, either." Pediatric asthma specialists at St. Louis Children's Hospital keep a close watch on the growth of their patients who use inhaled steroids, Strunk says. They are measured at every visit, and physicians keep a growth curve. "If a child is not growing as they should, we may reduce their steroid dose," he says. "But we think that the half-inch of lowered adult height must be balanced against the well-established benefit of inhaled corticosteroids in controlling persistent asthma. We will use the lowest effective dose to control symptoms to minimize concerns about effects on adult height." Inhaled corticosteroids such as budesonide are the most effective form of anti-inflammatory treatment for asthma, which affects 9.4 percent of U.S. children. The drugs control symptoms and improve pulmonary function. Results from the original CAMP trial, begun in the mid-1990s, showed that using budesonide twice daily led to fewer hospitalizations and urgent care visits, fewer days in which additional asthma medications were needed and a reduced need for albuterol. Using nedocromil twice daily reduced urgent care visits and courses of oral steroids for severe symptoms but did not affect the number of hospitalizations, symptoms or airway responsiveness. How Are Pharmaceutical Drugs Named?